Read on for our choice of recommended things to do in Manuel Antonio on vacation! Manuel Antonio, located near Quepos, where you are probably staying, is an outdoor and sports lover's dream vacation venue. With stunning inland forest, mountain and coastal landscapes, you will have a thrilling time. Try white water rafting, surfing, kayaking or exploring on a leisurely Segway. Enjoy a romantic sunset sail on a catamaran or catch the big one on a deep sea fishing expedition. Dare devils can zipline or enjoy the rugged off-roads in an ATV. All the tours are led by knowledgeable local guides, are totally safe and make great family bonding experiences. 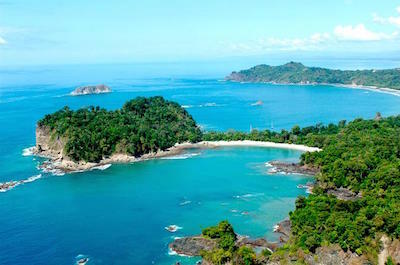 The first thing to do in Manuel Antonio or Quepos, is to spend a day in the Manuel Antonio National Park. It has been named by Forbes magazine as one of the most beautiful parks in the world. This stunning landscape is a gem waiting to be discovered by visitors to Costa Rica. You can take a guided tour led by a knowledgeable local guide. Hike along the scenic trails that wind their way through mountain landscapes and lush jungles. See sloths, white-tailed deer, some of 180 species of exotic birds and strange insects that can viewed close up through the guide's telescope. Then enjoy a swim in the crystal clear waters. The Park offers four stunning beaches, known for endless white sand and azure water. Enjoy Teloro and Playita, Manuel Antonio and Espadilla Sur, with tide pools that make fabulous snorkling spots. You can also dive to discover the diverse and magnificent marine life under the water. The tours are ideal for families and most offer lunch or snacks as part of your fabulous day adventure. 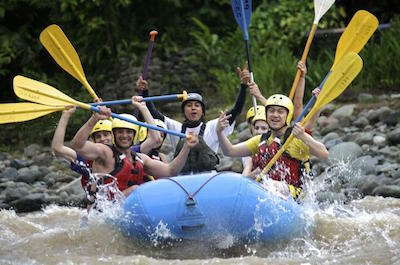 If you have not yet experienced the fun of white water rafting, this is an adrenaline pumping thing to do in Manuel Antonio. Start with a trip down the Savegre River. It offers Class II and Class III rapids that are navigated in sturdy rafts that can accommodate tow to six people. Your local guide will stop at lovely swimming spots and take you past awe-inspiring waterfalls. Along the way you will be treated to an abundance of wildlife such as egrets, parrots, kingfishers, osprey, toucans and other exotic species that thrive in the protected rain forests. The trip is a steady 13 miles down the river and then back to enjoy a well deserved Tico-style lunch at the quaint village of Silencio. More experienced rafters can navigate the Naranjo River which offers Class III and IV rapids, recommended for those who are fit! The ride starts at the point where the Naranjo River tumbles down the rocky slopes from the heights of the Costa Rican mountains and rushes though lush jungle gorges, swirling around breathtaking cliffs to the lower levels of the calm ocean waters. Your skilled guide will be with you all the way as you navigate these thrilling rapids. If you have a chance, take a look at the lovely passing scenery of farmlands, African Palm plantations and cattle grazing on the land. This 7 mile ride is a sensational experience that will leave you with thrilling memories. 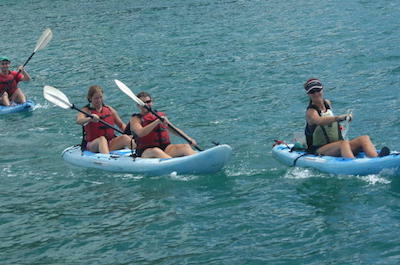 Kayaking offers a relaxed and private way to explore the natural wonders of Costa Rica and taking a guided kayak tour is another fabulous thing to do in Manuel Antonio. Join the Mangrove Damas tour which takes you along the meandering rivers through the winding waterways of the Damas Estuary and the lush mangrove forests. Your experienced guide is an expert naturalist and will educate you on the fauna and flora as you paddle along. These wetlands are part of the largest mangrove ecosystem in Central America and offer a huge variety of birds and animals that you are sure to spot as you paddle along. This is a great adventure for a family as you can travel in double kayaks Ð super fun for kids and adults. After exploring the inland rivers, try out your kayaking skills on the open ocean. The tour takes you to Quepos and around the islands. You can stop and enjoy some time snorkeling to discover the amazing marine life under the ocean. See parrot fish, angelfish, starfish and lazy sea turtles. The trip then stops at the beautiful hidden Biesanz Bay, where you will catch your breath, relax and enjoy a snack in this idyllic paradise setting. There are an abundance of cruises and water tours on offer, with something for all tastes. Joining some of them is the next fun filled thing to do in Manuel Antonio. Set off on the Spanish Dancer, a 37-foot MacGregor sport catamaran that can hold 12 people, ideal for a family or a group of friends. Leave from Marina Pez Vela and head to the open waters, keeping an eye out for dolphins, migrating humpback whales and manta rays. The views as you sail along are stunning, as you are treated to landscapes of jagged high cliffs, misty islands and awe-inspiring rock formations. Your knowledgeable guide will tell you all about the region and its unique animal, bird and marine life. Stop at the lovely Biesanz Bay where you can do some snorkeling or just relax on deck. Your next water adventure is a fabulous boat trip through the waterways of the mangrove forests. Set sail and learn all about this unique region and its creatures. Spot crocodiles, herons, ospreys, kingfishers and more. Lunch is served after your trip. For something totally romantic, take a sunset catamaran cruise with amazing views of the Antonio National Park. Relax on board with a loved one and an exotic cocktail in your hand. The fiery orange sunsets are a sight to behold. If you intend popping the big question Ð you won't find a more perfect opportunity! Calling all horse riders, experienced or not! 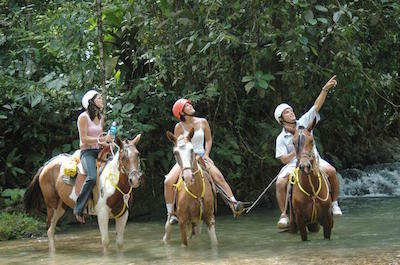 Exploring the diverse landscapes of beautiful Costa Rica on horseback gives you a a whole new perspective and is an amazing thing to do in Manuel Antonio. Enjoy a private tour organised by the Don Gilberto Ranch. Learn all about the history of the Quepos Indians up to the current day. See the exotic birdlife and animal life as you cross rivers, ride through the lush jungle and navigate the Reserve. The trip stops at the magnificent Waterfall of Quebrada Arroyo where you can dip in a natural pool fed by the falls. Lunch consists of scrumptious homemade tortillas. Then visit the Botanical Garden and learn how the Gilberto family have preserved the natural species for local use. Another horse ride adventure leave from Londres, a rural town outside of Manuel Antonio. Have a riding lesson and get assigned a trusty steed suited to your riding skills. Follow your guide through the farmlands and head into the jungle where you will stop for a dip in a natural waterfall pool. For a romantic experience, ride along an exotic beach as the sun sets. Stop to sip a cocktail and enjoy an appetizer with a loved one. The sunsets are breathtakingly stunning and will create memories to last a lifetime. 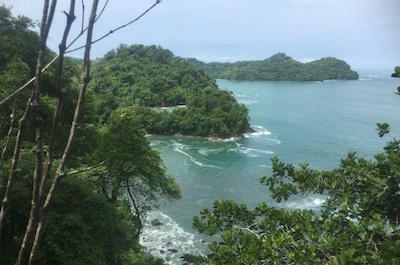 Nature fans and lovers of the outdoors will find that joining a nature hike is a fun filled thing to do in Manuel Antonio. The National Park is one of the most beautiful in the world and can be explored on a scenic walk with a knowledgeable guide. Join a 2.5 hour walk and learn all about the region and its eco-systems from your professional naturalist. See white sandy beaches, lush tropical forests and mangrove swamps. Look out for sloths, iguanas, basilisks, white-nosed coatis, bats and over 180 species of birds. The stroll is leisurely and ideal for a family. A snack and fresh tropical fruit is provided. After the walk, you can enjoy a swim in the calm azure waters of the ocean. Another walk takes you along a crowd-free coastal track for a distance of about 5 miles. Walk with an experienced naturalist and learn all about the creatures and plants of this diverse landscape. The views of cliffs and ocean are breathtaking and you will stop at remote and hidden beaches where you can relax and have a dip. This off-the-beaten path walk is for the slightly fitter person who enjoys a challenge. After horse riding and walking, the next thing to do in Manuel Antonio is to soar like a bird above the forests! Join a zipline tour and see the views from a completely new perspective. 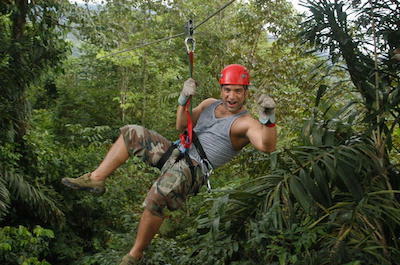 The Small Group Canopy Tour is ideal for a family or group of friends. Meet your guide, have a lesson and a safety briefing, put on your helmets and jump! You will soar on the ziplines above the jungle forests, seeing spectacular views and an abundance of birds and animals. On another great tour, you will sail across the forest on the Manuel Antonio canopy course. It offers eleven different zipline cables at heights ranging from 256 feet to 1500 feet. For daredevils, there is also a 50 foot rappel and a Tarzan Swing. Zip from one platform to another and get a new perspective on life as you soar above the tree tops! Then take a walk along the swinging suspension bridges. After that, you will be shock-proof and can relax back at the base and enjoy a well earned snack. This is a not-to-be-missed experience for any lover of extreme sports. 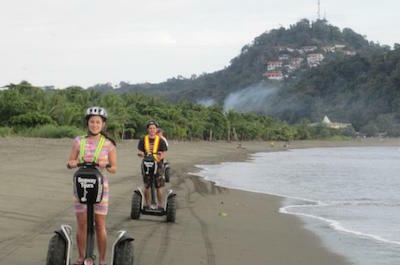 Riding a Segway is a unique and different thing to do in Manuel Antonio. These fun two wheel bikes requires no previous experience and no great level of fitness. Simply stand on the platform, lean forward and off you go at a leisurely pace. Your tour starts with a short lesson and safety briefing from your experienced guide. Put on your safety helmet and set off to the Nahomi Park, near to the Marina. The Park is located in a beautiful cove and is filled with history that your guide will tell you all about. Look out for monkeys and sloths hanging from the trees. Leaving the Park, you will ride along the Quepos waterfront. Next you are in for a fun experience! You will board a ferry with your Segway and sail to the nearby Island of Damas. Here you will disembark and explore the pristine, untouched jungle on your Segway. Follow your guide along stunning beaches and stop at a small colony of local fisherman who live off the land. The tour is very relaxed with many rest breaks along the way. Stop to taste freshly cut sugarcane, sip some coconut juice and even pick some cashew nuts straight off the trees. Return to the Marina to chat over a delicious traditional meal with your fellow Segway travellers. 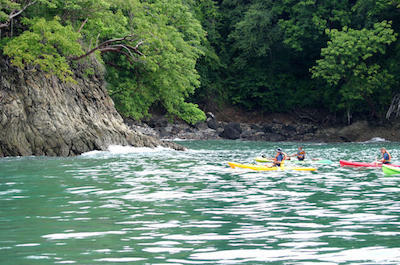 If you are looking for a marine adventure, a snorkling tour is the thing to do in Manuel Antonio. The tours combine a kayak ride and snorkeling and offer a delicious traditional lunch. Meet your guide and have a quick lesson and a safety briefing. Get settled into your one or double seater kayak and set off following your guide. The pace is adjusted to suit the fitness level of your group and can move as fast or slowly as you want. Wind your way along the magnificent coastline for a distance of about one mile, a journey that takes around 40 minutes. You will stop along the way and spot exotic birds, wildlife and sea creatures. The trip stops at the beautiful hidden jewel of Biesanz Bay where some well earned snacks are waiting for you. Then it is into the water for snorkeling. Get geared up with the equipment provided, follow your guide and explore three different coral reefs, bursting with underwater life. Be awed by the colorful corals, sponges, the massive sea turtles, manta rays and other exotic creatures. When you have had your fill of snorkeling, the tour kayaks back to the National Park where you will find a delicious meal waiting for you in a stunning natural setting. Do you dream of catching the big one, sailing back to shore and showing it off? If this i son your bucket list, the next thing to do in Manuel Antonio is take part in a fishing tour. The Damas Island mangrove waterways offer a combination of fresh water and salt water fish, unique in the world. 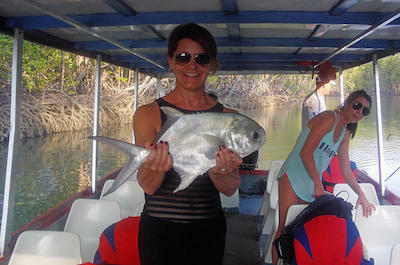 Join a tour led by an experienced crew and try your hand at fishing in these exotic locations. You can be a beginner or a professional, the tours cater for all levels, with equipment provided. 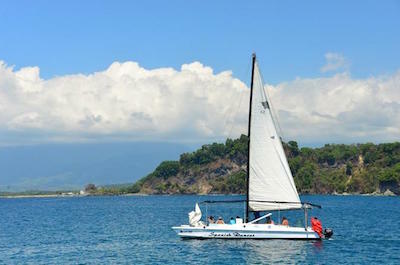 Set sail from Manuel Antonio and head to Damas Island, about 20 minutes away. Enjoy the stunning scenery and a chance to spot dolphins, sea turtles and other marine creatures as you sail along. Once in the mangrove forests, your guide will help you snag red or black snappers, groupers or snooks. You may also find sea basses and small barracudas. Learn about different fishing techniques like spinning, trolling, bottom fishing and using live bait. Your guide will suggest the best technique depending on tides, weather and water conditions. All the boats are regularly checked for safety and and are equipped with light, medium and heavy tackle, canopies and comfortable seats. Exploring the diverse landscapes of Costa Rica on an ATV is a thrilling, fun filled thing to do in Manuel Antonio. 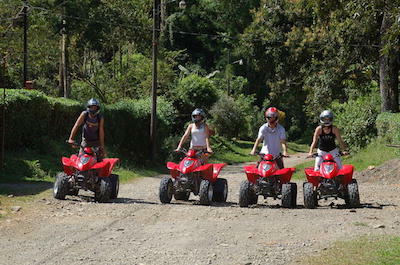 You can choose a tour that offers one seater or double ATV's, ideal for an adult and a child or a romantic couple. Meet your professional guide, have a short driving lesson and a safety briefing, put on your protective gear and set off. The ATV trips take you off the beaten track, into the stunning diverse landscapes. Experience the lush forest jungles, the mangrove swamps and massive plantations filled with teak, rice, papaya and African palms. You will bounce along rugged trails, get dusty and wet and have the best fun ever. Stop at a spectacular waterfall and take a dip in the natural pools fed by the cascading waters. Then take a short hike into the rain forest jungle and look out for monkeys, toucans, sloths and a wide variety of exotic tropical birds. Back on your ATV, head off to see traditional rural villages where you can stop and chat to the locals and sample some freshly cut sugarcane. As you travel along, your knowledgeable guide will update you on the history and culture of the region and also give you fascinating information on the eco-systems, flora and fauna. Your ATV ride heads back to the Ranch where a well-earned Tico-style meal will be waiting for your group. The best time to try out something different is when you are on vacation in an exotic location. Taking a surfing lesson is our next recommended thing to do in Manuel Antonio. The tour picks you up at your hotel and heads to the nearby public beach. Here you will meet your professional instructor who will start from the beginning and teach you the techniques you need to balance, stand, steer and get wave-borne as fast as possible. Have a blast and even catch some waves - without falling. Make sure someone has a camera to capture the moment! When you get tired, relax on the beach under an umbrella and sip a fresh exotic tropical fruit juice before hitting the waves again. For a more in-depth experience, the Beach Hopping tour takes you to Matapalo Beach and Playa Linda. Both are beautiful local beaches where you can have some privacy while you learn. The day is planned with games, competitions and fun activities to suit your group. Your guide will give you a lesson in balance, steering and catching the waves. Take your time, he is extremely patient and soon you will look like a pro! Then you can relax on the beach in a hammock and sip an exotic coconut or tropical fruit juice. Afterwards, explore the waterfalls and jump from the rocks into the natural pools below. A super fun day for all that is not-to-be-missed. Looking for another fun watersport? If you don't yet know what SUP is, it is the next exciting thing to do in Manuel Antonio. Stand Up Paddleboarding is great fun and makes a fabulous family sport, perfectly suited for kids. Set off in a comfortable air-conditioned van and head to the coast with your professional guide. On the way, you will stop to admire some of the most beautiful beaches, scenery and natural wildlife. When you arrive at the beach, you will have a 20 minute lesson and briefing from your instructor. You will then get into the water and try out your skills. The pace will be set according to the levels of fitness of your group. Go fast, go slow, float or paddle Ð it is up to you. It is much easier than it looks and soon you will be paddling around and admiring the underwater life that can be seen below the crystal clear water. The ocean setting is idyllic with rain forests and mountains as a backdrop. The tour takes you to explore a number of different beaches with tropical fruit juice refreshments and rests stops along the way. Your final beach stop is the famous Biesanz Beach, known for clear, calm water where you can swim, play and show off your newly acquired SUP skills.